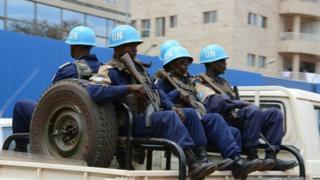 Four people have been killed during protests against the UN peacekeeping mission in Central African Republic. Peacekeepers opened fire when demonstrators tried to force their way into the UN headquarters, says a BBC reporter, who saw bodies being taken away in a police vehicle. The peacekeepers were deployed after civil war broke out in 2013 when then-President Francois Bozize was ousted by mainly Muslim Seleka rebels. But the UN has been hit by several allegations that its troops have been sexually abusing children. A coalition of civil society organisations called on residents of the capital, Bangui, to stay at home in protest at the UN mission in CAR, known by its French acronym, Minusca. "But wherever the UN forces go there is violence," protest organiser Gervais Lakosso told AFP news agency. As well as the four civilians killed, 14 people were injured in the clashes on Monday, with five peacekeepers among those hurt, according to a Minusca statement. The BBC's Max Allaroum in Bangui says the deadly shooting took place at the main square in Bangui, not far from the UN headquarters. Minusca spokesman Vladimir Monteiro told our reporter the UN had only fired of tear gas to disperse the demonstration. Numerous armed group still operate across the country - both Seleka and Christian self-defence forces set up to tackle them, known as anti-Balaka.